I am loath to give free advertising to a product, but I guess since we all do it inadvertently on social media by talking about movies we like, music we listen to, hobbies, food, etc., it doesn’t really matter if I post about some shoes. This spring, I wrote about problems with my shoes. A reader recommended I contact the manufacturer, Mizuno, to see what they could do, and it turned out the shoes were under warranty. After I got the return approved, I finally got around to mailing them back in. I don’t know why going to the post office is something I put off the way most people put off the dentist, but it is. So, they’re a bit brighter than I thought. I expected more of a minty green. I like them, but I prefer the color in the photo. When I first started running in them a few weeks ago, my feet cramped a bit during the first few miles, especially on softer trails. Pain like that led me to use inserts in my shoes before, but I knew I’d run in a similar model of shoe without this pain, so I decided to run through it until the shoes were broken in more, and I don’t have the foot pain anymore. These shoes are really heavy. They weigh 10.2 oz, making them Mizuno’s heaviest shoe (they actually have a shoe that only weighs 2.2 oz. I can’t even fathom that. It would be like wearing a flip-flop.) It doesn’t feel like I’m clomping around with cement shoes or anything like that, but when I switched over from my old shoes, I noticed a difference at first. The extra weight is from the cushion and the shock-absorbing sole. They really do absorb the pounding of the pavement nicely. Sometimes clods of mud or other debris get stuck in the shock-absorbing bottom of the shoe and rattle around a bit, but I have also noticed my feet don’t get as wet or as cold because the bottom of my foot isn’t actually touching the ground. I don’t have any unusual fit issues with shoes, like extremely high arches, or an uncommon width. I haven’t had my gait analyzed or a professional shoe fitting (I chose these shoes originally because I wanted to see what a $200 shoe felt like, and they were on sale for like $80), so maybe I am completely unaware of some huge issue with the fit of my shoe. That makes this shoe review fairly useless, because I can’t say “Well the toe box is [wide/narrow/long/whatever] and the shoe is totally different from the previous model!” I don’t know, it’s a shoe. There are all these reviews on the shoe’s page where the reviewer said they loved the Prophecy 1 and 2, but the 3 sucked, and now the 4 is great! I don’t really get it. I had a durability issue with the 3, but I don’t notice that the 4 feels any different than the 3. Of course, I didn’t use the shoes back to back and analyze every step. I am spoiling myself (specifically my feet, shins, and knee) with these shoes, because they are not worth the price to me at this point, but for someone with injury issues, they could definitely be worth the price, because they really do absorb a lot of the pounding that one’s body normally does during running. And I don’t know, maybe the “insulating” effect they have in the winter will make them worth my money sooner rather than later. 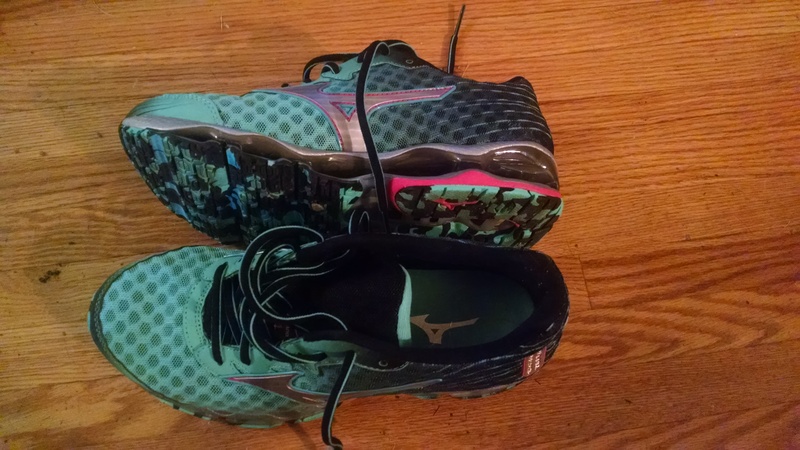 Posted on 4 July 2015 4 July 2015 by RWD	This entry was posted in Gear and tagged Mizuno, running, running shoe review, Running shoes. Bookmark the permalink.